Gardella Racing has joined forces with the automotive industry’s first true wholesale club, YoParts.com. 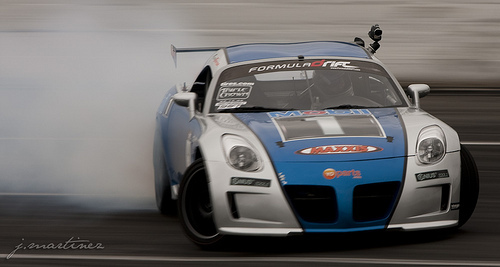 In 2010, GR and YoParts.com will be joining forces on the quest for a Formula Drift championship. The partnership will have YoParts.com providing parts from their extensive warehouse and GR will provide name exposure on the Pontiac Solstice. For GR this partnership means they will have greater and quicker access to parts for Ryan Tuerck and Steve Angerman to compete in 2010. Without this access the downtime waiting for parts would hinder the team in competing for the Formula drift championship. For the GR and Formula Drift fan that cannot make it to an event, Yoparts.com has announced that they have partnered with Formula Drift to provide the first ever comprehensive interactive live stream broadcast called DriftStream!. If you are too far from an event, too busy or just don’t have the money to pay for tickets, this means that you can watch the Formula Drift action where ever you are or whatever your excuse. To get more information on this cutting edge technology click here. This is great news because with this live stream broadcast GR will have a camera in the pit area that will allow our fans to see the team work all weekend long. Watch for more information about this soon. Make sure to come out and see YoParts.com and GR in Long Beach, Calif., April 9-10 for Round 1, The Streets of Long Beach, of the 2010 Formula Drift season.